The historian G. R. Searle argued that the reforms had multiple causes, including "the need to fend off the challenge of Labour; pure humanitarianism; the search for electoral popularity; considerations of National Efficiency; and a commitment to a modernised version of welfare capitalism." By implementing the reforms outside of the English Poor Laws, the stigma attached to claiming relief was also removed. 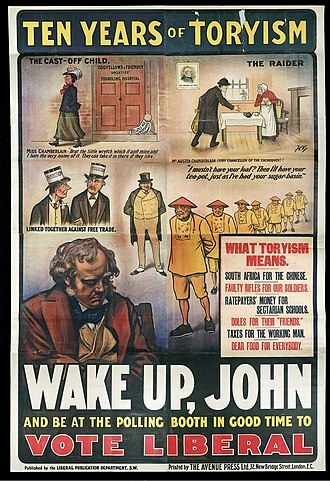 During the 1906 general election campaign, neither of the two major parties made poverty an important election issue and no promises were made to introduce welfare reforms. Despite this, the Liberals led by Henry Campbell-Bannerman and later H. H. Asquith won a landslide victory and began introducing wide-ranging reforms as soon as they took office. 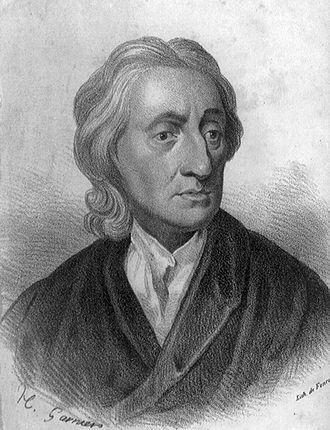 The influence of Gladstonian liberalism declined with the rise of modern liberalism. The split within liberalism led to the rise of modern liberalism within the Liberal Party, and the de-emphasis of what some refer to as "classical" liberalism, which had allegedly been the dominant ideology within the party. Historically, liberalism emphasized a system of government to protect liberty; historically, liberalism viewed the threat to liberty as mainly coming from the force and coercion of the state. The split within liberalism occurred when many liberals viewed threats to individual liberty arising from sources other than the state, such as from the concentration of money, the amalgamation of power, or in the destitution of the poor, the sick, or the elderly. Modern liberalism was an ideology which promoted an active government as the best guardian of liberty – both theoretical liberty and effective liberty – through government aid. Several 'New Liberals' such as David Lloyd George and Winston Churchill replaced the earlier ideology apparent in figures such as William Ewart Gladstone (see Gladstonian Liberalism) who felt that people should be responsible for their own lives. The social investigations of Charles Booth and Benjamin Seebohm Rowntree. These investigations helped change attitudes towards the causes of poverty. Booth carried out extensive research into the poor living conditions and poverty experienced in London, whilst Rowntree made a social investigation into the problems experienced by the poor in York. These investigations provided statistical evidence for genuine moral concern for the poor. They stated that illness and old age were greater causes of poverty than idleness and moral weakness. 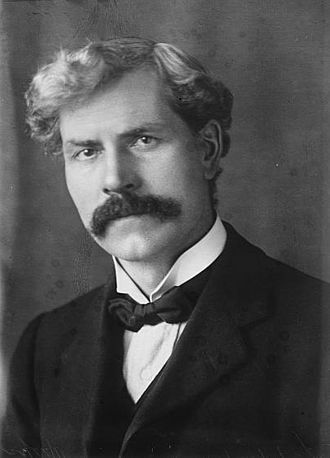 Rowntree was himself a close friend of Lloyd George; the pair first met in 1907 after Lloyd George became President of the Board of Trade. 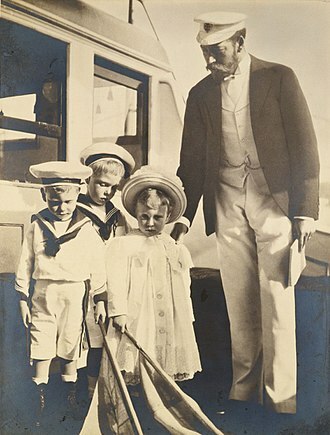 Rowntree himself hoped that his proposals could influence Liberal policy. The threat from the emerging Labour Party. Socialism was an increasingly popular ideology. If the Liberals did not put forward popular policies, they were in danger of losing votes and handing the House of Commons to the Conservatives. The trade union movement was growing especially during the period 1910–1912. Unless living conditions were improved, there were genuine concerns that workers may turn to Communism or rebellion. 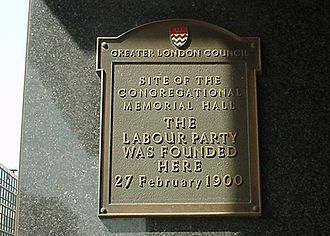 The fact that the Labour Party allowed the Liberals to return to form a government, as they held the seats needed for a majority after the 1910 general election, meant that further legislation was passed, since the Labour Party, which was socially democratic, was allied to workers through their affiliated trade unions. The condition of soldiers during the Boer War was considered unacceptable. The UK Government had trouble enlisting enough able-bodied recruits to the British Army. Germany and the United States were overtaking Britain as economic powers – the success of social legislation in Bismarck's Germany made leading Liberals in the UK such as David Lloyd George and Winston Churchill want to put forward similar legislation. 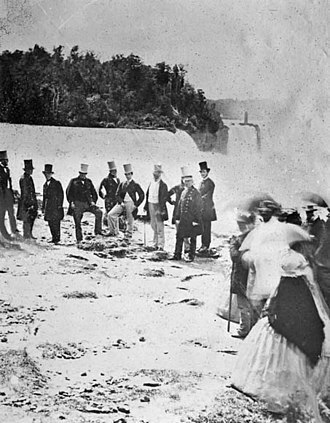 The emergence of public works schemes set up to improve living conditions which were often run by the Liberals raised the possibility that such schemes could occur on a national scale. The Conservative government in office before the Liberals came to power passed the Unemployed Workmen Act 1905 and the Employment of Children Act in 1905. Slum housing was also cleared for new houses to be built. Much of this legislation was left for local authorities to implement – their attitudes affected whether legislation was fully implemented. In 1902 Conservatives passed the Education Act that provided funds for denominational religious instruction in Church of England and Roman Catholic schools. The Nonconformists who formed a major Liberal constituency, were outraged at the help to their theological enemies, but failed to repeal it. A favourite goal of Protestant nonconformists was to sharply reduce the heavy drinking by closing as many pubs as possible. Asquith—although a heavy drinker—took the lead in 1908 by proposing to close about a third of the 100,000 pubs in England and Wales, with the owners compensated through a new tax on surviving pubs. The brewers controlled the pubs and organized a stiff resistance, supported by the Conservatives, who repeatedly defeated the proposal in the House of Lords. However, the "People's Tax" of 1910 included a stiff tax on pubs, and during the World War their hours were sharply restricted from about 18 hours a day to ​5 1⁄2. Beer and liquor consumption fell in half from 1900 to 1920, in part because there were many new leisure opportunities. In 1906, children were provided with free school meals. However, many local councils ignored this system, as it was not compulsory for them to provide the free meals and the cost to the council was far greater than was subsidised for. The provision of free school meals was made compulsory in 1914, in which year fourteen million meals per school day were served (compared with nine million per school day in 1910), most of which were free. In 1912, half of all councils in Britain were offering the scheme. 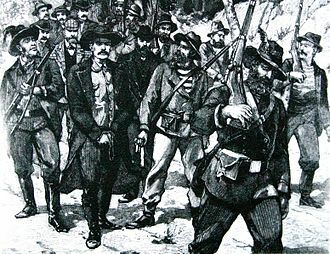 Recruitment for the Second Boer War demonstrated the undernourishment and illness among the working classes, and there were fears over future generations being unable to maintain military control of Britain's empire. Also, following an unfavourable report by the Board of Education's inspectors on infant education in 1906, school provision for children under five was restricted (previously, the normal age for the entry of working-class children into full-time education had been three). In 1907, the Notification of Births Act came into being, which sought to quantify and analyse the causes of (and ultimately further reduce) infant mortality. The Education (Administrative Provisions) Act 1907 introduced what became known as the Free Place System. The Regulations for Secondary Schools issued that year authorised the payment of a £5 per head grant for each pupil between the ages of 12 and 18, and schools had to conform to certain requirements in order to attain this grant. 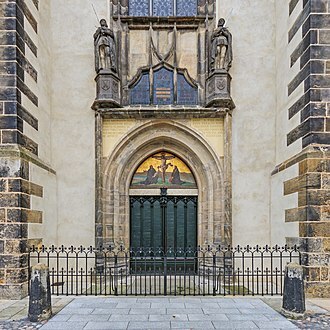 Schools couldn’t restrict admission to pupils belonging to particular religious denominations, governing bodies had to be reconstituted to include a number of representative governors (some of whom represented the LEA), and at least 25% of the annual intake should be pupils from elementary schools. The Act of 1907 also provided Local Education Authorities with the power to acquire land for constructing new secondary schools, which led to the coming into being of many county and municipal secondary schools. In 1907, the number of free scholarship places in secondary schools was increased. If working-class pupils passed a scholarship examination, then their fees would be paid for them by the Local Education Authority (LEA). A quarter of places in most secondary schools would be reserved for scholarship pupils. Bright working-class children were therefore provided with the opportunity to climb "the educational ladder", while for those pupils who failed the scholarship exam, some LEAs had "Central Schools" which provided a practically based curriculum for children between the ages of 11 and 15. The Probation Act 1907 established a probation service to provide supervision within the community for young offenders as an alternative to prison. In 1908, the Children and Young Persons Act 1908 formed part of the "Children's Charter" which imposed punishments for those neglecting children. It became illegal to sell children tobacco, alcohol and fireworks or to send children begging. Juvenile courts and borstals were created instead for young offenders so they did not have to stand in adult courts and go to adult prisons for most offences. The 1908 Education (Scotland) Act enforced medical inspection, free books and travel, free meals and clothing grants, and some bursaries. Medical inspections began in 1907 but many poor families could not afford the cost of the doctors fees to get treated; it was not until 1912 that medical treatment was provided. However, education authorities largely ignored the provision of free medical treatment for school children. A tax allowance for children was introduced in 1909 to help families on low incomes. This allowance of £10 a year was introduced for every child below the age of 16 in the case of income tax payers whose income fell below £500 per annum (this rebate was later doubled in the 1914 budget). The Irish Universities Act of 1908 gave to Roman Catholics higher education facilities “which they had lacked for centuries,” while the Education (Choice of Employment) Bill passed in 1910, enabling local authorities to provide vocational guidance for school-leavers, with the Board of Education providing grants to authorities from 1911 onwards to carry out this purpose. By mid-1912, however, only forty-one local authorities had responded. The pensions were means-tested (to receive the pension, one had to earn less than £31.50 annually) and intentionally low to encourage workers to make their own provisions for the future. An example of how low this amount was is that if an elderly person was to live on their pension alone they fell below Rowntree's poverty line. It was a struggle for elderly persons to claim their pension as they had to prove that they were not drunkards, for example. Also, to qualify for the pension scheme, they had to have worked to their "full potential". There were no fixed guidelines as to what "full potential" was, so people who had been briefly unemployed could be penalised. To be eligible, they also had to have lived in the country for 20 years or more, so many immigrants could not claim a pension, or British people who had worked abroad and returned to Britain to retire. Also pensioners could not claim a pension if they had been to prison in the last 10 years. On 31 December 1908 a total of 596,038 pensions had been granted. In 1906, the Factory and Workshop Act 1901 was amended to include laundries, and under the Labour Exchanges Act 1909 labour exchanges were set up in order to help unemployed people find work, by providing centres where a large number of employers and the unemployed could post jobs and apply for them respectively. By February 1910, eighty-three labour exchanges were open, and proved to be invaluable in helping people find employment. In 1913 these labour exchanges were putting around 3000 people into a job each day. Another measure taken was the 1909 Development Fund, which was an attempt to provide work in times of Depression. This fund was devoted to increasing employment opportunities through measures such as afforestation and the provision of smallholdings in the countryside. In addition, the government encouraged the adoption of Fair Wages contracts by local authorities. In 1908, special regulations were made for electrical safety. The Regulations of 1907 for the manufacture of paints and colours prohibited women and young persons from manipulating lead colour (defined as any dry carbonate of lead, red lead or any colour containing either of these substances) and ordered monthly medical examinations of all employees engaged in a lead process. Regulations introduced that same year concerning the heading of yarn dyed by means of a lead compound prohibited the employment of young persons and prescribed the medical examination “of all workers in the process once every three months.” The Trade Boards Act 1909 created boards to set minimum wage criteria that were legally enforceable. The main provision was to set minimum wages in certain trades with the history of low wages, because of surplus of available workers, the presence of women workers, or the lack of skills. At first it applied to four industries: chain-making, ready-made dresses. paper-box making, and the machine-made lace and finishing trade. About 70 per cent of their 200,000 workers were women. It was later expanded to coal mining and then to other industries with preponderance of unskilled manual labour by the Trade Boards Act 1918, and by 1924 to farm labourers. The Mines Accidents (Rescue and Aid) Act 1910 provided for the availability of first aid treatment, rescue work, and fire precautions at mines, and that same year a central Road Board was established to fund improvements in road conditions, a measure made necessary by the new motor traffic. Upon its introduction, the new Board began at once to enable the County Councils to begin tarring the surfaces of main roads. Under Part 1 of the National Insurance Act 1911, compulsory health insurance was provided for workers earning less than £160 per year. The scheme was contributed to by the worker who contributed fourpence, the employer who contributed threepence and the government who contributed twopence. The scheme provided sickness benefit entitlement of nine shillings (£36), free medical treatment and maternity benefit of 30 shillings (£120). An estimated 13 million workers came to be compulsorily covered under this scheme. Part 2 of the National Insurance Act passed in 1911 gave workers the right to sick pay of 9s a week and free medical treatment in return for a payment for 4d a week. Sick pay would be paid for 26 weeks of sickness. The medical treatment was provided by doctors who belonged to a "panel" in each district. Doctors received a fee from the insurance fund for each "panel" patient they treated. The National Insurance Act (Part II) gave workers the right to unemployment pay of 7s 6d a week for 15 weeks in return for a payment of 2½d a week. Under Part 2 of the National Insurance Act 1911, which dealt with unemployment insurance, most insured workers were given seven shillings in unemployment benefit which could be claimed for up to 15 weeks a year. This scheme was also financed through the contributions of workers and government. Although only a minority of workers were insured by this scheme, it nevertheless covered a number of trades and industries, such as shipbuilding, which were particularly vulnerable to fluctuations in employment. 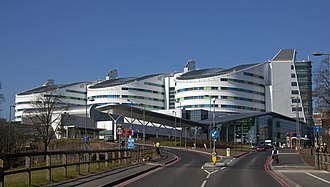 Although the National Health Insurance scheme was not universal in its coverage, it was nevertheless of great benefit to the majority of Britons. The scheme safeguarded health and made Britain a fitter nation, while doing much to accustom wage earners to medical attention. Doctors also benefited from the scheme in that it provided most of them with a more reliable and higher income, and led to an increase in the number of doctors. The National Health Insurance scheme arguably paved the way for the eventual establishment of the more comprehensive and universal National Health Service (NHS). Various measures were introduced to improve the quality of rural life. The Agricultural Holdings Act, passed in 1906, allowed farmers to farm their holdings without interference from landlords. 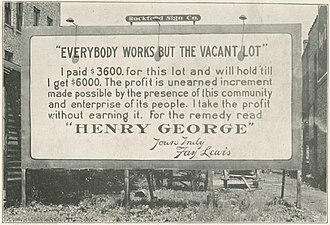 The Small Holdings and Allotments Act of 1907 and the Consolidation Act of 1908 sought to limit the degree to which fixtures and improvements remained the property of landlords, and to increase the number of small farmers. Another Smallholdings and Allotments Act, passed in 1908, empowered county councils to purchase agricultural land to lease as smallholdings. Between 1908 and 1914 some 200,000 acres were acquired by county councils and some 14,000 holdings were created. In Ireland, the Land Purchase Act of 1909 “helped force landlords to sell land to tenants.” Under the leadership of David Lloyd George Liberals extended minimum wages to farm workers starting in 1909 then succeeding in 1924. After the 1910 general election the Liberal Party did not have a majority in the House of Commons and so entered into a coalition with 42 Labour Party MPs who had been elected. This led to further reforms as the Liberals required Labour support and Irish support to remain in office. In 1912, school clinics were set up to treat children who had been diagnosed as having an illness during a School Medical under the 1907 scheme. This measure ensured that more children had access to free medical care. From 1912, Exchequer grants were paid to education authorities providing medical treatment for children, and by 1914, 214 out of the (then) 317 local authorities were providing some kind of medical treatment for children. Regulations introduced in 1911 concerning the smelting of materials containing lead and the manufacture of red or orange lead and flaked litharge prohibited the employment of women and young persons in these processes and ordered monthly medical examinations of all employees. The Factory Workshop (Cotton Cloth Factories) Act of 1911 provided the Secretary of State with the power to make regulations to improve conditions in cotton cloth factories in relation to ventilation and humidity, while The Labourers (Ireland) Act of 1911 applied the dormant portion of the Irish Suitors’ Fund to the purposes of the Labourer’s Cottages’ Fund, while bestowing authority upon the Irish Land Commission “to extend the limit of advances which may be made” for the provision of allotments and houses from £4.5 million to £5.5 million, while also providing further powers for the demolition of unhealthy cottages. The Public Health (Ireland) Act empowered Irish local authorities to set up regulations for the seizure of unsound meat and for inspecting slaughterhouses, while the Public Health (Scotland) Act of 1897 was amended in 1911, extending the powers of local authorities under the Public Health (Scotland) Act to any body of commissioners or trustees authorised to supply water. The Public Libraries (Art Galleries in County Boroughs) Ireland Act of 1911 empowered Dublin and other county councils to strike a half-penny rate for the support of art galleries, while the Old Age Pensions Act of 1911 improved residency requirements for entitlement to pensions. The Intestate Husband’s Estate (Scotland) Act of 1911 provided widows in Scotland with the same right as in England to a first charge of £500 on the property of her deceased husband if he died intestate, while a Public Works Loans Act passed that same year authorised the use of £5.5 million of public money for public works. In 1913, the status of day technical classes was raised to that of junior technical schools. In 1913, five additional wage boards were set up that covered hollow ware making, shirt making, sugar confectionery and food preserving, tin box making, and linen and cotton embroidery, along with a portion of the laundry industry. These extensions led to an additional 140,000 being covered by minimum wage legislation. The Public Health (Prevention and Treatment of Disease) Act 1913 empowered local authorities to formulate tuberculosis schemes, while a Trade Union passed that same year clarified the legal position of trade unions while also restoring their political power, together with the financial position of the Labour Party. In 1914, Local Authorities received grants from the government to provide maternal and child welfare services. while the Criminal Justice Administration Act passed that same year compelled magistrates to allow for sufficient time to be made for paying fines. As noted by the historian C. P. Hill, this legislation was both merciful and economical, as it helped to reduce the prison population. The budget of 1914 brought greater progressivity into the taxation system by increasing levels of direct taxation on the wealthy while also investing more money in social services. The educational grant was increased, with money allocated towards the training of specialist teachers, schools for the deformed, grants for open-air schools for victims of tuberculosis, and further state provision for school-meal services. In addition, new provisions for maternity centres, sanitoria, and ancillary health services under the 1911 insurance bill were introduced, together with £4 million in loans for local authority house-building. 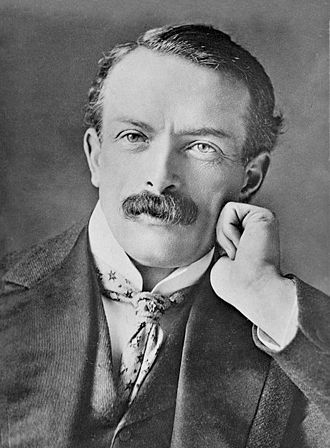 The Liberal reforms were funded by David Lloyd George passing his Finance Bill (that he called "the People's Budget") which taxed the "rich" in order to subsidize "working" citizens and the ill and injured. The budget met opposition in the House of Lords and, contrary to British constitutional convention, the Conservatives used their large majority in the Lords to vote down the Budget. In response, the Liberals turned to (what they believed to be) the widespread unpopularity of the Lords to make reducing the power of the Lords an important issue of the January 1910 general election. The Liberals returned in a hung parliament after the election: The Liberals formed a minority government with the support of the Labour and Irish nationalist MPs. The Lords subsequently accepted the Budget when the land tax proposal was dropped. However, as a result of the dispute over the Budget, the new government introduced resolutions (that would later form the Parliament Bill) to limit the power of the Lords. The Prime Minister, H. H. Asquith, asked Edward VII to create sufficient new Liberal peers to pass the Bill if the Lords rejected it. 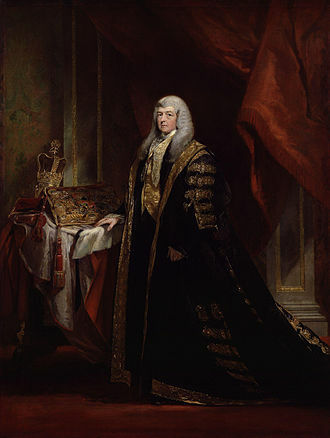 The King assented, provided that Asquith went back to the polls to obtain an explicit mandate for the constitutional change. 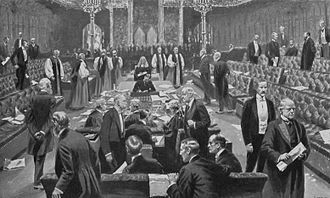 The Lords voted this 1910 Parliament Bill down, so Asquith called a second general election in December 1910, and again formed a minority government. 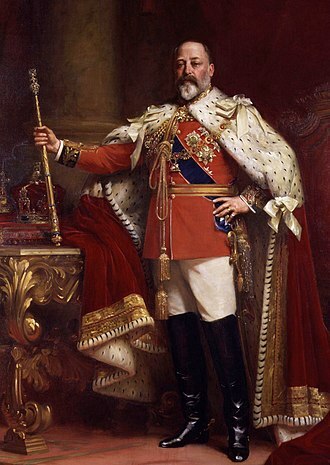 Edward VII had died in May 1910, but George V agreed that, if necessary, he would create 500 new Liberal peers to neutralise the Conservative majority in the Lords. The Conservative Lords then backed down, and on 10 August 1911, the House of Lords passed the Parliament Act 1911 by a narrow 131–114 vote. In his War Memoirs, Lloyd George said of this time, "the partisan warfare that raged around these topics was so fierce that by 1913, this country was brought to the verge of civil war." While the Liberal reforms were one of Britain's most ambitious welfare reform programmes, there were several limitations to the reforms they passed. Free school meals were not compulsory. 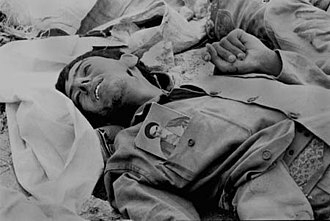 Pensions were refused to those who had not been in work most of their life and life expectancy at birth at this time was only 55 so relatively few people lived long enough to receive a pension. The labour exchange programme often managed to find people only part-time casual work. 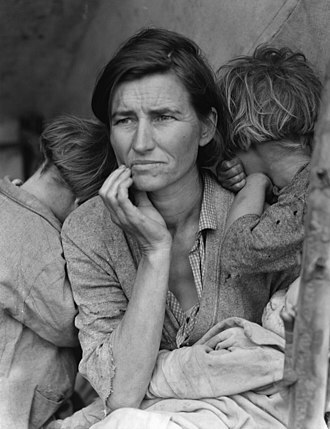 The poor had to pay National Insurance Contributions out of their wages and the 7s 6d was not enough to live on. Unemployment and sickness pay also only lasted for a limited time. Free medical care was available to only a wage-earner, not the wife or children or grandparents and other relatives. The new National Health Insurance scheme also did not provide coverage for all forms of medical care. It did not provide cover for special advice while many people could not get acquire dental, ophthalmic or other treatment through NHI. Also, other people were not covered for convalescent homes, while the only specialist services for those in NHI were for TB and VD. The welfare measures introduced by the Liberal government concerning the sick, the elderly, and the children did, however, lead to a reduction in poverty, with the total number of paupers falling from 916,377 in 1910 to 748,019 by 1914. The Liberal reforms received criticism from those who saw this level of government action to mitigate social evils as interfering with market forces and thus being antithetical to the operations of a free market. One political cartoon of the time criticised the reforms as socialist in nature. The cost of the reforms was also criticised and there were also critics who suggested that the reforms would not work in practice. There were classical liberals who opposed these reforms; this included Harold Cox, elected as a Liberal in 1906, and who was almost alone among Liberal MPs in his opposition. He considered them to be "eroding freedom" and "undermining individual responsibility". 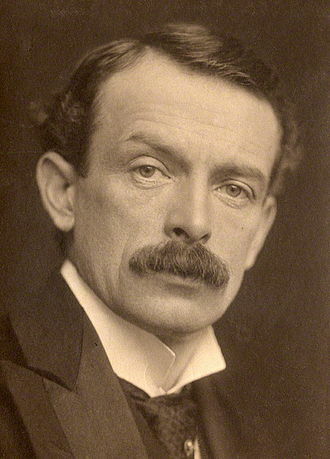 The Liberal journalist and editor of The Economist (1907–1916), F. W. Hirst, also opposed the reforms and the welfare state in general. Some workers objected to paying 4d per week to the National Insurance contributions. The chant "Taffy was a Welshman, Taffy was a thief" was chanted at Lloyd George by workers and referred to the suggestion that Welshman Lloyd George was taking their wages away from them. 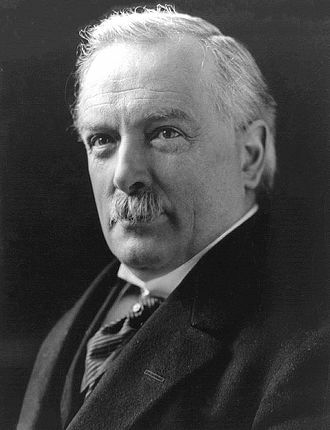 However, Lloyd George responded with his famous phrase "Nine pence for four pence" which referenced to the fact that employers and the government were topping up the workers' contributions. 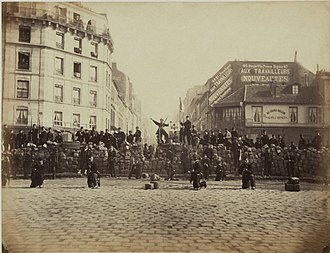 Trade Disputes Act 1906 – Protected labour unions from frivolous legal claims, such as the subject of a strike claiming economic damages caused by the voluntary withholding of labour by workers, or the subject of a boycott claiming the union economically damaged them by encouraging people to voluntarily shop elsewhere. Workmen's Compensation Act 1906 – Granted compensation for injury at work. Education (Administrative Provisions) Act 1907 – created school medical inspections. Coal Mines Regulation Act 1908 – Miners now worked 8-hour days. Shops Act 1911 – shop workers could now take half a day off work per week. From 1911 MPs were given a salary of £400 per annum, meaning that it was much easier for working-class people to stand for election. ^ G.R. Searle (2004). A New England? : Peace and War, 1886-1918. p. 369. ISBN 9780198207146. ^ "The National Archives Learning Curve | Britain 1906-18 | Liberal Welfare Reforms 1906–11: Gallery". Learningcurve.gov.uk. Retrieved 24 January 2010. ^ a b c "GCSE Bitesize – History | Modern World History | Britain 1905–1951 | Reforms and reasons". BBC. Retrieved 24 January 2010. ^ "Education Scotland – Higher Bitesize Revision – History – Liberal – Motives: Revision 2". BBC. Retrieved 24 January 2010. ^ "The National Archives Learning Curve | Britain 1906–18 | Liberal Welfare Reforms 1906–11: Gallery Background". Learningcurve.gov.uk. Retrieved 24 January 2010. ^ Donald Read, Edwardian England, 1901–15: society and politics (1972) p 52. ^ Colin Cross, The Liberals in Power, 1905–1914 (1963) pp. 69–71. ^ Paul Jennings, "Liquor Licensing and the Local Historian: The Victorian Public House". Local Historian 41 (2011): 121–137. ^ Heggie, Vanessa (2008-04-01). "Lies, Damn Lies, and Manchester's Recruiting Statistics: Degeneration as an "Urban Legend" in Victorian and Edwardian Britain". Journal of the History of Medicine and Allied Sciences. 63 (2): 178–216. doi:10.1093/jhmas/jrm032. ISSN 0022-5045. PMID 17965445. ^ a b An Introductory History Of English Education Since 1800 by S.J. Curtis, M.A., Ph.D, and M.E.A. Boultwood, M.A. 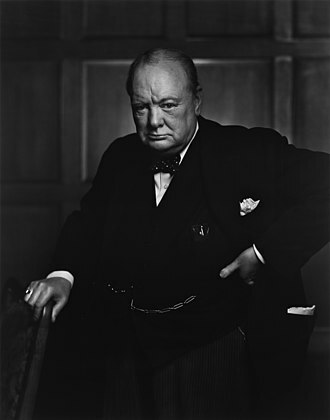 ^ a b "GCSE Bitesize – History | Modern World History | Britain 1905–1951 | The important reforms". BBC. Retrieved 24 January 2010. ^ Paterson, L. (2003). Scottish Education in the Twentieth Century. Edinburgh University Press. p. 43. ISBN 9780748615902. Retrieved 29 January 2017. ^ a b Childers, E. (2012). The Framework of Home Rule. tredition. ISBN 9783847202035. Retrieved 29 January 2017. ^ a b "Education Scotland – Higher Bitesize Revision – History – Liberal – Impact: Revision 1". BBC. Retrieved 24 January 2010. ^ Tanner, D. (2003). Political Change and the Labour Party 1900-1918. Cambridge University Press. p. 64. ISBN 9780521530538. Retrieved 29 January 2017. ^ "Two steps forward, one step back - History of Occupational Safety and Health". historyofosh.org.uk. Retrieved 29 January 2017. ^ Sheila Blackburn, "Ideology and social policy: the origins of the Trade Boards Act." The Historical Journal 34#1 (1991): 43-64. ^ Edward John T. Collins; Joan Thirsk (2000). The Agrarian History of England and Wales. p. 1670. ISBN 9780521329279. ^ "John Burns". spartacus-educational.com. Retrieved 29 January 2017. ^ "Education Scotland – Higher Bitesize Revision – History – Liberal – Impact: Revision 2". BBC. Retrieved 24 January 2010. ^ "Key dates - UK Parliament". parliament.uk. Retrieved 29 January 2017. ^ Ranelagh, J. 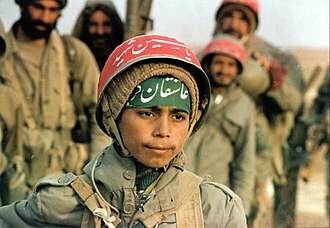 (1994). A Short History of Ireland. Cambridge University Press. p. 160. ISBN 9780521469449. Retrieved 29 January 2017. ^ Alin Howkins and Nicola Verdon. "The state and the farm worker: the evolution of the minimum wage in agriculture in England and Wales, 1909–24." Agricultural history review 57.2 (2009): 257-274. ^ Waltman, J.L. (2008). Minimum Wage Policy in Great Britain and the United States. Algora Pub. p. 64. ISBN 9780875866024. Retrieved 29 January 2017. ^ Ayers, G.M. (1971). England's First State Hospitals and the Metropolitan Asylums Board, 1867-1930. University of California Press. p. 218. ISBN 9780520017924. Retrieved 29 January 2017. ^ "The National Archives Learning Curve | Britain 1906–18 | Achievements of Liberal Welfare Reforms: Gallery 2". Learningcurve.gov.uk. Archived from the original on 7 September 2008. Retrieved 24 January 2010. ^ "1909 People's Budget". Liberal Democrat History Group. Archived from the original on 30 September 2006. Retrieved 6 October 2006. ^ "Government Formation from a Hung Parliament" (PDF). Oxford University Press. Retrieved 8 October 2006. ^ "Reform and Proposals for Reform Since 1900". House of Lords. 19 April 2000. Archived from the original on 18 July 2006. Retrieved 6 October 2006. ^ "Herbert Henry Asquith 1908-16 Liberal". 10 Downing Street. Archived from the original on 25 September 2006. Retrieved 10 October 2006. 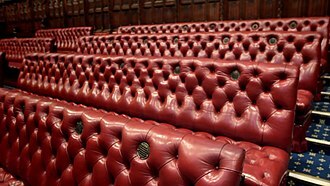 ^ "Joint Committee on House of Lords Reform First Report – Appendix 1: Historical Background". The Stationery Office. 11 December 2002. Archived from the original on 30 September 2007. Retrieved 11 October 2006. ^ a b "GCSE Bitesize – History | Modern World History | Britain 1905–1951 | Four Results of the Liberal reforms". BBC. Retrieved 24 January 2010. ^ "The National Archives Learning Curve | Britain 1906–18 | Achievements of Liberal Welfare Reforms: Critics: Source 2". Learningcurve.gov.uk. Retrieved 24 January 2010. ^ "The National Archives Learning Curve | Britain 1906–18 | Case Study: Critics". Learningcurve.gov.uk. Retrieved 24 January 2010. ^ W. H. Greenleaf, The British Political Tradition. Volume Two: The Ideological Heritage (London: Methuen, 1983), pp. 95–97. Briggs, Asa. "The Political Scene" in Simon Nowell-Smith, ed. 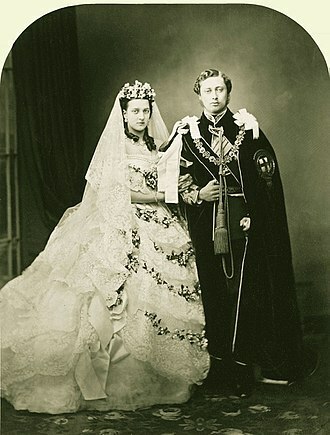 Edwardian England, 1901–14 (1964), 43-102. Brown, Kenneth D. "The Labour Party and the Unemployment Question, 1906–1910." Historical Journal 14#3 (1971): 599-616. Cregier, Don M. Bounder from Wales: Lloyd George's Career Before the First World War (U of Missouri Press, 1976). Daglish, N. D. "A ‘difficult and somewhat thankless task’: politics, religion and the Education Bill of 1908." Journal of educational administration and history 31.1 (1999): 19-35. Gilbert, Bentley Brinkerhoff. "David Lloyd George: Land, The Budget, and Social Reform." 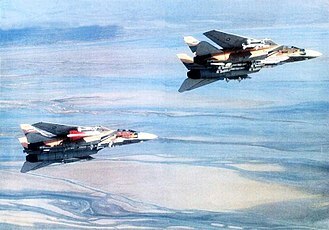 American Historical Review 81.5 (1976): 1058-1066. Halévy, Elie. History of the English People, 1905-1914 (1934), 686pp. Harris, Bernard. The origins of the British welfare state: social welfare in England and Wales, 1800–1945 (Palgrave, 2004). Mommsen, Wolfgang J., and Wolfgang Mock, eds. The emergence of the welfare state in Britain and Germany, 1850-1950 (Taylor & Francis, 1981). Murray, Bruce K. The People's Budget, 1909-1910: Lloyd George and Liberal Politics (1980). Packer, Ian. Liberal government and politics, 1905-15 (Springer, 2006). Packer, Ian. Lloyd George, liberalism and the land: The land issue and party politics in England, 1906-1914 (Boydell & Brewer, 2001). Quinault, Roland. "Asquith's Liberalism." History 77.249 (1992): 33-49. Thompson, James. "The Genesis of the 1906 Trades Disputes Act: Liberalism, Trade Unions, and the Law." Twentieth Century British History 9.2 (1998): 175-200. Weiler, Peter. The New Liberalism: Liberal Social Theory in Great Britain, 1889-1914 (Routledge, 2016). The Liberal Year Book: 1908. 1908. Back-to-back houses are a form of terraced house in which two houses share a rear wall. Houses of this type had become common in city areas of Victorian England, especially in Birmingham, Leeds, Manchester, Salford. In Leeds, this style of terrace continued to be right up until 1937 when it was decided that houses should be of a higher quality. The advent of council housing after the First World War resulted in councils organising programmes of slum clearances which were all part of redevelopment programmes. These procedures saw the beginning of demolition of back-to-back houses in the 1920s. The process started again in the 1950s and continued through the 1960s, however, in cities such as Leeds and Bradford significant numbers remain and are still being used as housing. Back-to-back houses can be known as blind-backs particularly when built up against factory walls, other forms of back-to-back housing include tenements, tunnel-backs and cluster houses. Birmingham Back to Backs Beresford, M. W, the back-to-back house in Leeds, 1787-1939, in, Beresford, M. W.
The Irish Land Commission was created in 1881 as a rent fixing commission by the Land Law Act 1881, known as the second Irish Land Act. For a century it was the responsible for re-distributing farmland in most of Ireland. With the Ashbourne Act 1885, the Commission developed into a tenant-purchasing commission and this was a response to the turbulent Land War that had started in 1879. The Commission eventually transferred 13.5 million acres by 1920 and this was managed by the Land Commission, along with ancillary work such as compiling statistics. Valuations were reckoned on a years purchase basis, the price being a multiple of the annual rent, the Commission had to supervise the haggling process and find the fairest multiple for every transfer. The loans issued by government were resold in the markets as Land Bonds. By 1908 the emerging problem was whether the new owners would be viable on their small farms. It was realised by now that existing rural poverty arose from small sizes, yet the Acts procedures. The aim had been to create peasant proprietors owning what were usually small farms, by definition the activists in the 1880s Land War period had been poorer and more desperate, and few came from larger prosperous farms. This remained a matter of debate for the rest of the Commissions existence. Larger commercial farmers were characterised as landlords or grazers simply because they had more land than the average. In 1915 Birrell confirmed in Parliament that all Irish land transfers from 1885 to the end of 1914 had cost the British Government £91,768,450, and the tenants had invested a further £1,584,516. The Land Commission files for Northern Ireland were separated, allowing for the Land Commission to be re-established in, the Land Acts were varied in Northern Ireland in 1925, and the activities of the Land Commission were finally abolished in 1935. Some remaining tenants who had not to exercise their right to buy their farms formed the Unbought Tenants Association. The Commission was reconstituted in the Irish Free State by section 2 of the Land Law Act,1923, the Act dissolved the Congested Districts Board. A school meal or school lunch is a meal, typically in the middle or beginning of the school day, provided to students at school. Countries all over the world have various kinds of school meal programs, millions of children from all standards and grades get their meals at their respective schools every day. Scientifically and medically, school meals are regarded as a component of childrens upbringing. School meals provide high-energy food with high values for free. The benefits of school meals vary from country to country, while in developed countries the school meal is a source of nutritious meals, in developing countries it is an incentive to send children to school and continue their education. In developing countries, school meals provide food security at times of crisis and help children to become healthy and productive adults, thus breaking the cycle of poverty, in all cases, school meals allow children to focus on their studies, without hunger as a distraction. Sweden, the Czech Republic, and Estonia are among the few countries which provide school meals to all pupils in compulsory education. Many governments in developing countries are increasingly using free school meals to improve attendance rates, in high-income countries, free school meals are usually available to children who meet income-based criteria. Reduced price meals are available in some countries to those who need a degree of assistance with costs. Lower-cost meals are available to students in countries as the Republic of Ireland, Italy, Hong Kong, Japan. When they are not provided to all students, free school meals can stigmatize children who do receive them, Studies have shown that many children entitled to free meals do not take them, and those who do may suffer negative consequences. Additionally, not all children who could benefit from free or reduced-price lunch qualify for it, organisations such as the Child Poverty Action Group have called for school meals to be provided free of charge for all pupils to address these issues. In the United States of America, Share Our Strength has funded free-school-meal-to-all pilot programs in school districts. A school lunch in Washington, D.C.
A typical Finnish school lunch served free of charge to all pupils. The Doctor by Luke Fildes used in a 1911 Punch cartoon commenting on the effects of the act.